Does Jotform has validation of fields? 4. 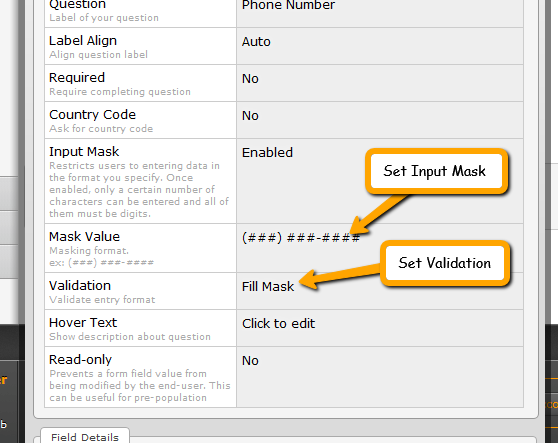 Do your forms support validation of fields and required fields. Meaning, if a user fills out fields, and an error is detected, will all the information persist on the form so the user can correct the error before continuing? Thank you for contacting us for support. I am more than happy to help out. Yes, Jotform provides features such as field validation and also required fields that will force the form user to enter the required information appropriately. You can review this test form that will demonstrate both features. You can follow the screenshot guides below if you would like to utilize these features in your form. Set a field as required. You can also sign up for a free account and experience the wide range of features that Jotform provides. I hope this answers your questions. Feel free to ask for further support if needed.